In bond rating reports issued for 2018, Standard & Poor's Global Ratings upgraded McKinney ISD's bond rating from AA to AA+, and Moody's reaffirmed the district's Aa1 rating. Both are the second highest possible ratings from each entity. 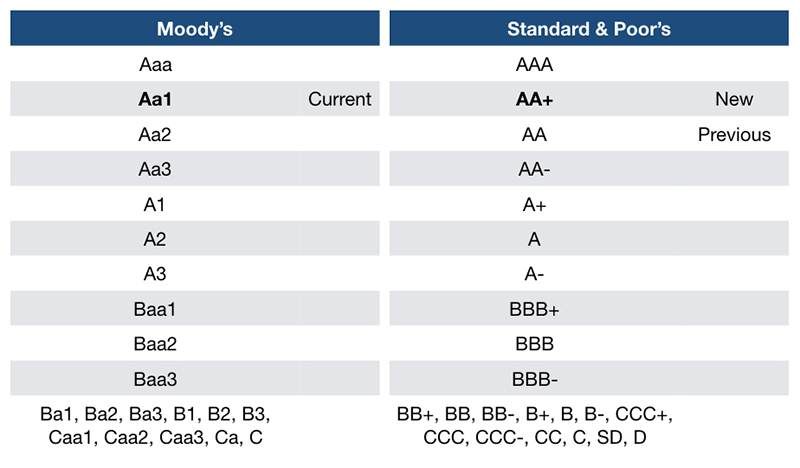 McKinney, Texas – Standard & Poor’s Global Ratings and Moody’s Investors Service have released their annual bond ratings for McKinney ISD, and both credit rating agencies have assigned the district their second highest ratings possible. For 2018, S&P has raised MISD’s general obligation debt rating to AA+ from AA. The AA+ rating is the second highest that S&P assigns with AAA as the highest possible rating. Texas Permanent School Fund (PSF) is pledged to guarantee bonds issued by Texas school districts thus enhancing their credit to Aaa (or AAA) allowing for lower borrowing costs. “I believe that this upgrade recognizes the ongoing hard work and long-term fiscal prudence displayed by the McKinney ISD Board of Trustees and staff,” said MISD Chief Financial Officer Jason Bird.